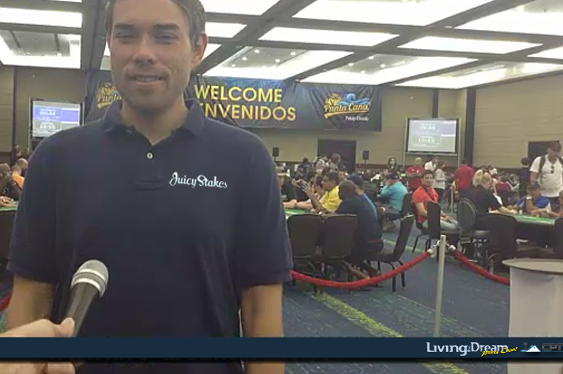 This summer and autumn, five online satellite tournament champions from Juicy Stakes and Intertops Poker won their way to the CPT Punta Cana Poker Classic main event in the Dominican Republic. The primarily online players shared their experience at the live poker tournament in daily Living The Dream video reports. It was 33 degrees Celsius and 94 percent humidity as the Living The Dream team arrived in Punta Cana – a (pleasant) shock to the system for the guys that hail from much cooler climates in Austria, England, Chicago and Pittsburgh. While Daniel dove right in and played one of many side events at the Punta Cana Hard Rock Hotel, Steve gave his first impression of Dominican Republic, the Punta Cana Hard Rock Hotel and the CPT Punta Cana Poker Classic as he waited for Derek, Phil and Neal to arrive in this report from Punta Cana. Steve won his way to the Caribbean via an online satellite tournament from Juicy Stakes. Steve, a toy wholesaler from Chicago, who won his trip to the Caribbean in an online satellite tournament at Juicy Stakes, is a recreational poker player who says patience is the key to winning a tournament. He wasn't patient enough to wait for the CPT Punta Cana Poker Classic main event though – he warmed up by playing a side event and winning his way into a $1,500 buy-in tournament. In the next episode the team talks about personal strategy and preparation for the CPT Punta Cana Poker Classic main event.